A. There have been some noticeable home decor trends in the past few years – coastal paint colors, wood paneled walls, brushed gold finishes, oversized geometric lighting, faux animal heads, and brightly patterned wallpaper. Some of these will be on the way out in the near future but open shelving has been around since the dawn of the modern kitchen and is most definitely here to stay. And there is a reason for that – it’s highly functional and visually interesting! The origins of the modern kitchen began with the hearth (fireplace) which was the main source of heat and light. Most living and family activities took place in that one room since it was the warmest place in the home. Tables were used for food preparation and horizontal boards placed above a table provided storage. Pots and kitchenware were stored on the open shelves. Eventually architecture of the home changed, the stove replaced the fireplace, water and electricity were made available, and storage elements developed into display dressers and cupboards. These changes were brought about by industrialization of the 19th century and standardization of the 20th century. Newly developed products and the rising of the middle class brought forth a change in family life and the role of women. 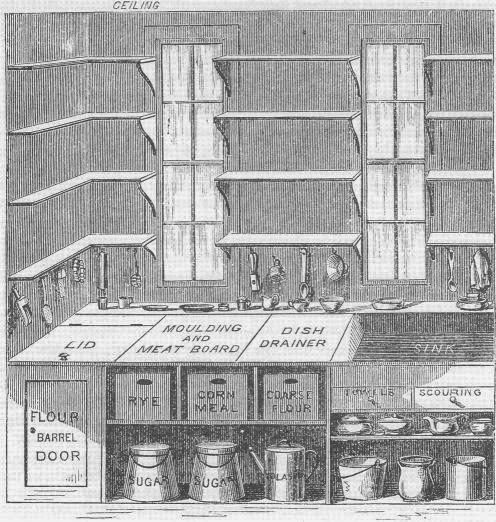 This led to the work of pioneers such as Catharine Beecher and her sister Harriet Beecher Stowe in the field of kitchen design as early as the mid-1800s. Together they published a book that made recommendations on how to plan an efficient kitchen and propagated their ideas for the “model kitchen” using a systematic design based on early ergonomics. They recognized that kitchens were not very functional and that families had to prepare their own food since the availability of household servants was reduced. The design included windows for light, ample countertop work space, dedicated bins for food items, and consistent, clearly-delineated shelves for storage that were shallow to allow one row of items for easy access. Today’s modern kitchen uses open shelving not only for practical purposes but also for aesthetic. Design comes into play with variation in shape, material, and color. Shelves can be wood or metal, floating or a fixed inside a cabinet with no doors, white on white or set against a brightly painted back panel. Wallpaper, tile, or a window can add some visual interest behind a stack of plates. Shelving isn’t just confined to the area above your head. An entire wall from floor to ceiling can have open shelving too. Whether a minimal or a crowded look is prefered, shelves offer a place to store items as well as display them. Character is immediately added to a kitchen as a trove of treasures adorns the walls. Tidy can be accomplished by grouping items together. The uniformity of white pitchers, stacked dishes, and bowls is simple yet stunning. For the bold and adventurous, kitchenware can rest next to picture frames, colorful cookbooks, unique mementos, and bottles of San Pellegrino. There are no rules, limitations, or expectations. Sources: Beamish, PhD, CKE, Julia, JoAnn Emmel, PhD, Kathleen Parrott, PhD, CKE, and Mary Jo Peterson, CKD, CBD, CAPS, CAASH. 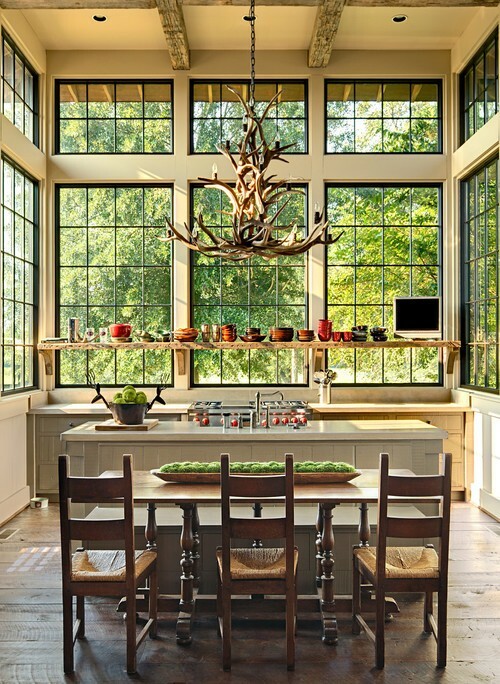 “Kitchen History, Research, and Trends.” Kitchen Planning: Guidelines, Codes, Standards. Second Edition. Ed. John Wiley & Sons, Inc., Hoboken, New Jersey, 2013. 1-45. Print. Does your home need some personality? Add life to your kitchen & bath with a new layout and customized details!